Over the past 5 years Answer Digital has been working in partnership with the NHS on a variety of projects, each of which looking to transform how a mammoth of an organisation and British Institution can change its digital capabilities for the better. With a headcount of over 1.2 million employees (ONS, 2018) and counting, the NHS is comfortably the UK’s biggest employer. With such a large entity the challenges undoubtedly become bigger, but so do the potential rewards for the British public. What is UX and Digital Transformation like in the NHS? User Experience (UX) as part of the Digital Transformation of the NHS affects all areas. Whether it’s on the road, within our hospitals, amongst emergency call-centre staff, or in GP surgeries. Allowing UX into the design process for each of these areas helps to ensure front-line staff have access to relevant technology which is intuitive and easy-to-use at a time of great stress, allowing them to focus on the stuff that matters. For example, Paramedics having tablets and hand-held devices when on the road; or call centre staff who want to view screens that enable their processes to be as efficient as possible, allowing them to understand and treat the patient as quick as possible. Involving UX as part of this development ensures user needs are considered, designed for and validated in an iterative development process. 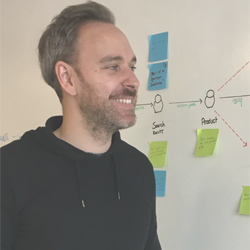 Although the challenge may change in a large public sector organisation, nothing changes around the principles of UX practice that are put into place. Throughout NHS Digital, there are UX Designers, User Researchers and advocates in the form of Product Owners and Project Managers which help to instill best practices, as well as third-party companies such as ourselves, working in partnership which help to promote and implement best practice techniques and a culture of UX in Agile on projects. True UX implementation requires buy-in at the highest level, regardless of organisation. At the heart of UX is the need to design with empathy for the user, considering who they are, their needs and their goals. Fortunately, this marries well with what is at the heart of the NHS, patient welfare. For UX to thrive this type of thinking needs to be culturally embedded within an organisation and its project teams. As a trusted partner it’s also our responsibility to drive this culture and ensure that UX style thinking is adopted by the colleagues we work with whether they be developers, project managers, business analysts or any other role. What are the challenges and limitations? Needless to say there are big challenges with an organisation the scale and complexity of the NHS. Growing pains, governmental policy changes, legacy issues, interoperability and differences between trusts can often complicate what might seem a small issue with an easily workable solution at first glance. Trusts are truly independent, allowing them to prioritise based on budget, staffing levels and crucially suppliers of their IT. This then poses challenges of integration between said suppliers when working on national projects which require the support of all trusts. Contact, transparency of information and a willingness to act are all understandable concerns from a business perspective of the supplier companies, but can hinder long-term digital transformation plans of the NHS and can slow the pace at which change can happen. On-boarding for new or existing colleagues following change can also be complex and time-consuming. The NHS is a continually transforming organisation by nature and so it can be difficult to have the sort of impact you might anticipate in short periods of time, or sprints. Research and testing from a UX perspective also pose a significant challenge. Identifying and arranging testing with users, often with a very niche skill-set and limited availability can make initial research and validation problematic. However, the want for testing amongst users is certainly there. NHS staff at all levels have a vested interest to help inform and improve these projects and see the potential in their involvement as they too benefit from any improved product or service through NHS digital initiatives. Finally connecting patient records and interoperability issues are something that the NHS are aware of and seem to be actively tackling through various programmes of work helping to connect patient data across the country and equally looking to improve supplier engagement. Plain English guidelines to ensure that public communications are clear and understandable for anyone to read are a clear sign of the direction the public sector is heading to make information more inclusive. The online NHS style guide and Identity guidelines are also reason for praise, which not only help to deliver a consistent brand message across the NHS, but are compliant to W3C standards, helping improve the accessibility of online information. Common User Interface (CUI) guidelines, a useful tool when designing UIs for NHS digital to ensure commonality across its interfaces, a necessity for healthcare professionals who move between mediums, though require a consistent understanding of the application they are working on. What are the end-goals and benefits to the NHS and wider public? When it goes right in the public-sector the benefits are huge and far-reaching. It’s testimony to the expertise and people of the NHS and NHS digital when these projects are seen through from concept to completion. When working collaboratively with established parts of the organisation UX implementation can help on a variety of fronts. Enhancing usability, reducing time in the on-boarding process for new users or improving the users speed through time-critical processes. Even by changing simple areas such as drop-down menus to buttons can help to save seconds, which when applied across the organisation can have massive effect and crucially on patient care. As the NHS and NHS digital move forward and become evermore reliant on digital technologies, it is hoped that they continue to adopt and build upon their UX capabilities across the organisation. As when they do, they will not only provide better outputs in their digital transformation through each project, but help to ensure that user needs and patient care have been considered and designed for, which is the cornerstone for our National Health Service. We help organisations within health, retail and finance sectors to shape, design and develop innovate bespoke customer-centric digital experiences that help deliver your digital ambitions. Get in touch to see how our customer-centric digital transformation expertise can help you deliver the right experience.